Mood board: Jonathan Anderson is quite the prêt-à-porter powerhouse. At Loewe, where he has been creative director since 2013, he has honed a knack for honouring traditional crafts in unstuffy ways. At his namesake label, JW Anderson, which is now in its tenth year, he has nurtured a new generation of fashion fans without the hoopla of seasonal drops, insta-friendly collaborations or a cavalcade of influencers. Just with great fashion, the odd cult bag or shirt. His seasonal Converse sneakers. His recent Your Picture/Our Future competition earlier this year summed up his outlook. People were invited to send in their work for the chance to shoot the brand’s latest ad campaign. Anderson asked: ‘Do you have image fatigue? Do you have a sharp vision? Do you want to be part of a new, new wave? Would you like to photograph our next campaign?’ His work has been the zeitgeist for a decade. For S/S 2019, the clothes came with a more relaxed confidence, inspired in part by the American sculptor and visual artist, Lynda Benglis, known for her poured latex sculptures. His clothes had the same tacit poise. Best in show: Anderson spoke backstage of empowerment, which led to a focus on fluidity. 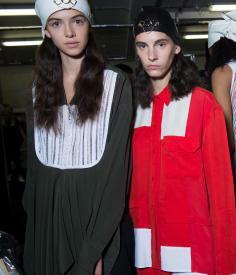 Striped, sheer blankets were cut into flowing dresses – some worn with macramé bibs. Patchwork shirting was paired with matching trousers, knitted tops grew into wide-weft macramé skirts. A loose-fitting stripped plissé tunic dress had a felted broderie anglaise collar. Anderson’s vision of femininity is often askew, with contrasts between soft and hard, tight and loose, prim and perverse. Here the clothes had a bright agility. Take the closing look – a tailored single button blazer based on elongated riding jackets worn with slim trousers in beige with brown leather knee and ankle patches. Even this had its kink eased out of it.